In this age when computers are all the rage, malicious hackers are doing everything in their power to create malware that harms your computer and worst of all they access your personal information. A shortcut virus is one of the most underrated pieces of malware, and most people are oblivious to the harm it can cause to their computers. It has far-reaching effects on your computer causing massive damage to your computer by disrupting the performance of your system. External storage devices such as an external hard disk, flash drive, phone memory, SD memory card and memory sticks, are the most vulnerable and once they are infected with the shortcut virus, it can replicate itself onto your computer. A shortcut virus is an anonymous piece of malware that converts your files and folders into shortcuts. Whenever you try to access a file or folder that looks like a shortcut, you get an error message. It infects your computer through email attachments, illegitimate software, even from downloads from certain websites. You can format your external storage devices if you do not have any important information in the infected files and folders. 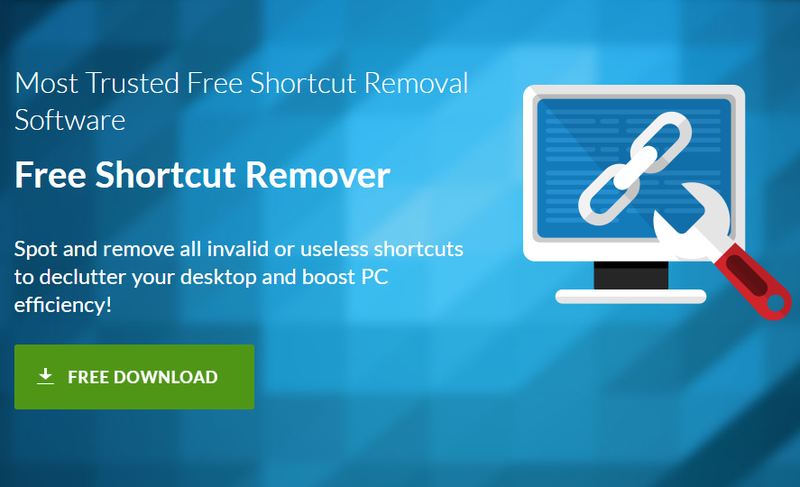 Free Shortcut Remover is the best option you have of eliminating the virus without any data loss, and the best part is that it is 100% free to download as well as having no charges. When you find your computer and external storage devices infected by the virus, you ought to download the Free Shortcut Remover. 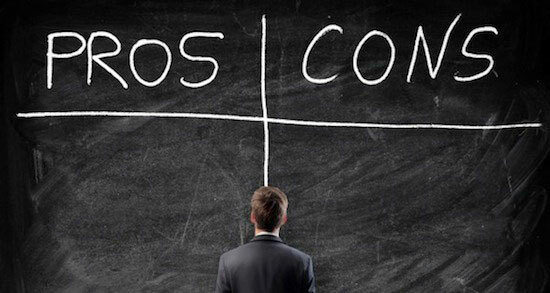 Here are some of the solutions the software offers to your problem. You might have a clean computer; free from any malware, but you can infect it during file transfer using external storage devices. For this reasons, Free Shortcut Remover can scan the external storage devices and flag the shortcut viruses masquerading as shortcuts. The software lists all the shortcuts in your computer or the drive you have specified. You can then view the properties of each shortcut. Free Shortcut Remover lists the shortcuts in columns and marks all the broken or invalid shortcuts with a red cross. 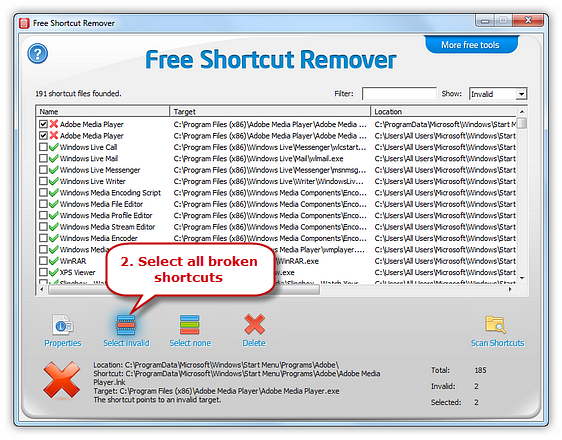 Free Shortcut Remover has an advanced filter function that allows you to find any shortcuts you think might be infected. All that you need to do is input part or entire name in the filter, and it will show the shortcut if it is valid or invalid. This is much faster than the software doing an entire system scan. After you have seen all the broken links, you can then remove them from your system with ease. 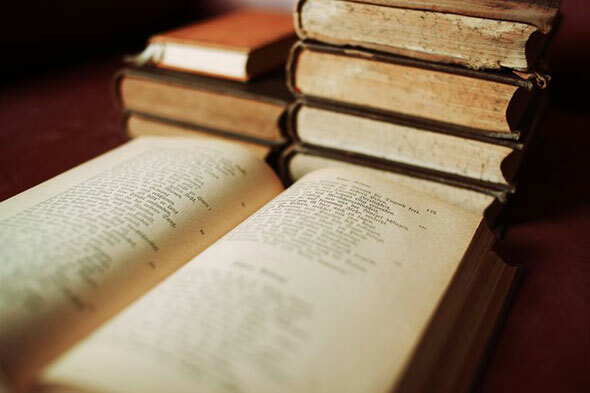 On the interface, simply click on delete shortcuts and they will be expelled from your system. Q: I have an up to date anti-virus, but I keep on seeing broken shortcuts in my drives. Why is this? 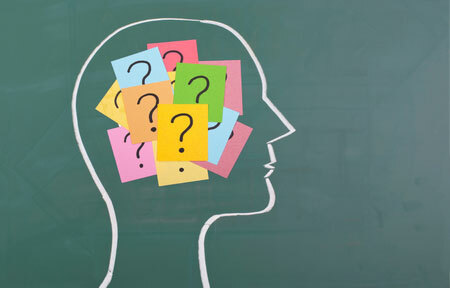 A: The unfortunate thing about a shortcut virus infection is that the mainstream anti-virus does not easily detect them. This is because the virus keeps on changing its name, location, and codes. Download Free Shortcut Remover and scan your computer for broken links and you can rest assured that when you delete the invalid shortcuts. 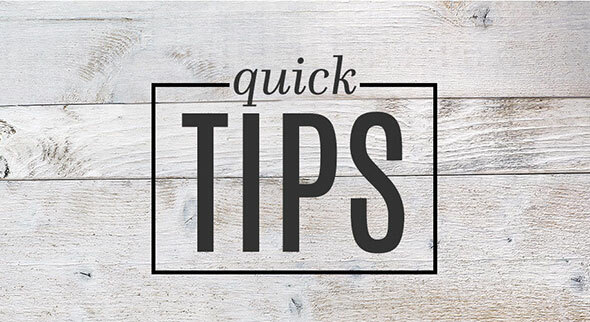 Before you transfer any files from an external storage device, ensure that you scan them first with the software to be safe from any threats. One thing about a laptop or computer is that it has most of your personal information. 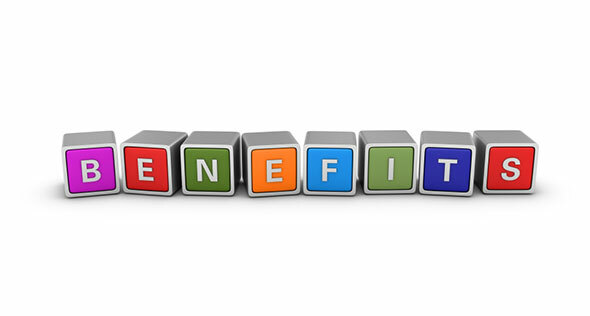 It is much easier to use the internet for banking transactions, shopping, et al. and this requires that you give your personal information. The site you visit will be in your history of your web browser. Free Shortcut Remover can clear your history automatically, and your information will be safe from any other person who has access to your computer. The virus masquerades as shortcuts, they keep changing, and this renders your anti-virus useless. Free Shortcut Remover will find and eliminate all the broken and invalid shortcuts from your computer. As soon as you have the software the better, it will stop the virus from replicating and changing its appearance as well as properties. All viruses cause system freezes, program lock-ups, and an overall slowing down of your PC. 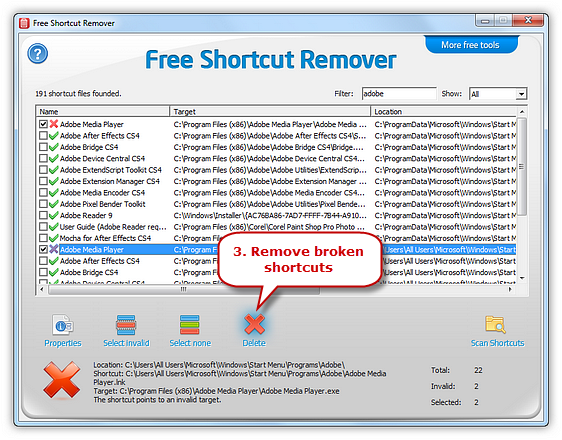 Free Shortcut Remover after the removal of the broken shortcuts will free up your system, and your PC performance will drastically improve to normal conditions. The download process of the software is easy and fast. The installation process is straightforward, and it creates a desktop shortcut for the quick launch of the software. After launching the software, click ‘Shortcuts’ to select a drive to scan and click ‘OK’. 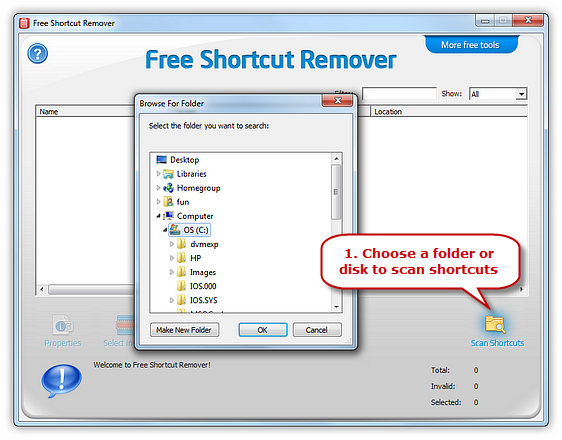 The scan starts immediately, after which Free Shortcut Remover displays all the shortcuts in the drive, with the broken shortcuts marked with a red cross. Click ‘Select Invalid’ to mark all the invalid and broken shortcuts. You can also click ‘Select None’ if you wish to deselect the shortcuts. Click ‘Delete’ to expel all the broken and invalid shortcuts from your computer. The advanced filter function allows you to find and identify the shortcuts in your computer easily and faster. You only have to input the whole or part of the name, and it will list all the shortcuts with a similar name. Click ‘Show’ and the software will display all the valid and broken shortcuts. When you are done with the scan, and you have the shortcuts displayed, double-click on each shortcut to view the properties. You can also select each shortcut then click ‘Properties’ to view the information about the shortcut. Malware – This is short for malicious software specifically designed to damage, disrupt, to gain authorized access to a computer or network system. Boot Sector – This is the section of a hard disk, or other storage device containing machine code loaded into the RAM by the computer’s inbuilt firmware. Spyware – This is a type of malware installed on your computer, mostly without your permission to collect information about your browsing habits, personal information, which are then sent to a remote user. Disclaimer: We cannot assure you of that downloading Free Shortcut Remover from third party sites will not pose a risk to your computer. The software is available for download from our site, and you can be sure that it is malware free. Shortcut viruses pose serious damage to your computer than you would like to believe. Since most anti-virus software cannot flag them down, get the latest version of Free Shortcut Virus to safeguard your computer.